To quote a great Donovan song from the '60's, "I'm just mad about Saffron." Now the true meaning behind those lyrics is intended for another type of blog all together -I'll just stick with the restaurant that shares its name with the spice. 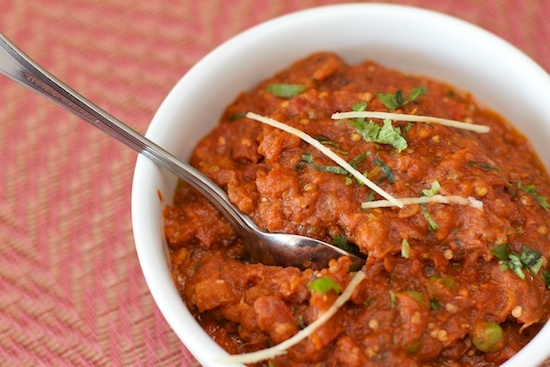 Saffron, the year old Indian restaurant located at 333 Westport Ave in Norwalk, is the labor of love for "Pinky" Kaur, a native of Northern India. The establishment is modest and seats about 35 guests, but just like the spice, a little SAFFRON goes a very long way. We ordered, (as is our tradition), an extensive selection of the menu, but each dish that arrived seemed more well executed than the one before. This is not fancy Indian; this is authentic North-Indian at its finest. Here's the play by play. ALOO PURI, curried potatoes served with fried unleavened flour bread, was on the buffet table and so, naturally, we were "forced" to try some. The potatoes were tender, with just enough structure so as not to dissolve on contact, and the curry flavoring was rich without overpowering. Also on the buffet was the typical CHICKEN TIKKA, skewered chicken chunks baked in the TANDOOR oven after being marinated in spices and yogurt. Brushed with GHEE (clarified butter) the TIKKA (a Hindu word meaning bits or pieces) arrives on your tongue like a gift from Annapurna (the Hindu Goddess of food and cooking!) 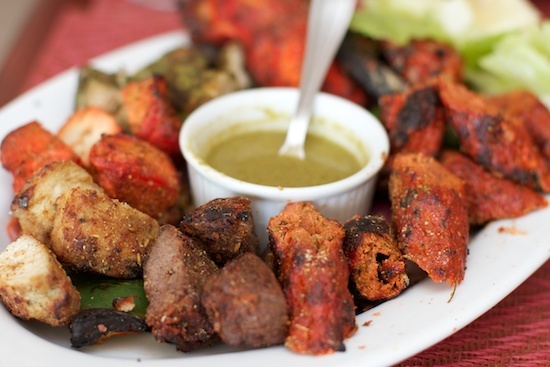 Served with coriander sauce and tamarind chutney, this TIKKA talks! Also on offer was an Indian version of good, old-fashioned TOMATO SOUP. Though perhaps not temperature hot enough for my asbestos-tongue, the soup was creamy, slightly tangy, and had fresh tomato flavor. A refreshing dollop of yogurt on top blended perfectly to compliment the already present acidity. Though everything on the buffet table looked delectable, we decided to stick to menu items for most of our choices in the hopes of catching a sample of all that Pinky and crew had to offer. Next up was one of my favorites, the BAINGAN BHARTHA, roasted eggplant which is mashed and cooked with chunky, sweet onions. The BAINGAN (eggplant) is grilled over charcoal which infuses the dish with a smoky flavor. It is then mashed with the onions, fresh cilantro and mustard oil. The result was a hearty and piping hot vegetarian ambrosia with a delicate hint of smoldering coals. Other vegetarian standouts were the DAL MAHKNI and the SAAG PANEER. This dark DAL, whose main ingredients are whole black lentils and red kidney beans, is perhaps the most quintessential vegetarian Indian dish. SAFFRON's is rich and exquisitely seasoned and hearty enough to be consumed as a main course. Don't get me wrong, we weren't only here for the veggies. These foodies do meat. 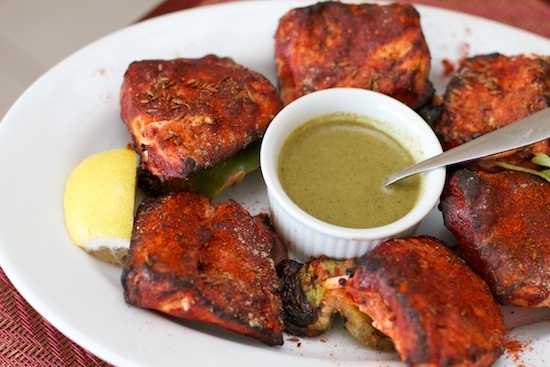 We made an excellent choice in trying the SALMON AJWANI TIKKA from the appetizer menu. This marinated and spiced salmon is skewered and cooked on a flat grill. Served with CORIANDER CHUTNEY, the cool green sauce is the perfect assuager for the tangy, flaky fish. Another fantastic dish for our carnivorous friends was the Non- Vegetarian SAMPLER PLATTER. On our dish were chunks of LAMB and GOAT, grilled to perfection, shrimp from the TANDOOR, house made CHICKEN SAUSAGE, as well as a medley of grilled VEG. This was a meat extravaganza that took no prisoners. As we recovered from our research, PINKY said, "You really MUST try these desserts." Though we groaned in protest, she twisted our proverbial arms and we acquiesced. Although Indian desserts usually aren't my cup of CHAI, these were phenomenal. It takes Pinky DAYS, literally, to make her world class rice pudding. I usually refer my rice "pud" hot, but the Indian way is to serve it chilled. Basmati rice is cooked, drained and then soaked in coconut milk and infused with cardamom, nutmeg and a dash of SAFFRON (how apropos!) and, on its own, is exquisite. But Pinky told us to make our bite of RICE PUDDING share half of the spoon with the other dessert she offered us, the GULAB JAMUN. Ok. I officially surrender. These dough balls from heaven are made mostly of milk solids, traditionally, Indian buffalo milk, and are rolled into a ball with some flour and then deep fried at a very low temperature. Then they are rolled in a sugary syrup flavored with cardamom, rosewater and - you guessed it, saffron. This is the KRISPY KREME of Indian cooking - decadent, but you haven't lived until you've tried it. The combo was, well, ridiculous. "Nuff said. Overall, SAFFRON is a winner in my books. Just one word of warning - if you ask for your food spicy, either order a LOT of Kingfisher beer or pack a fire extinguisher for your tongue. I pride myself on loving and being able to handle spicy food. And I am too accustomed to Fairfield County chefs "assuming" that we don't REALLY mean spicy when we SAY spicy. Pinky's different. She asked me once, twice, maybe even three times if I was SURE that I wanted the food spicy. "Bring it on," I challenged. There was nothing Mellow Yellow about the spice. It was HOT! 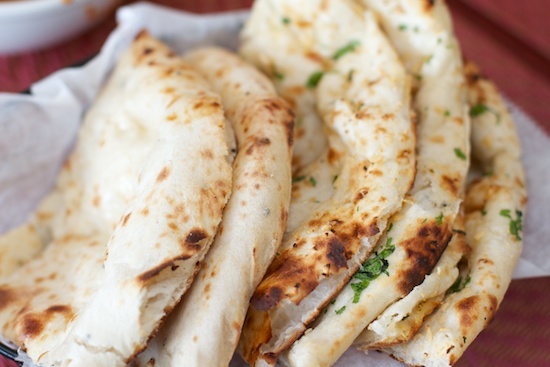 Saffron Indian Cuisine. Don't miss out.